But until then there is a workaround that involves using a JScript to set the selected item in the list. 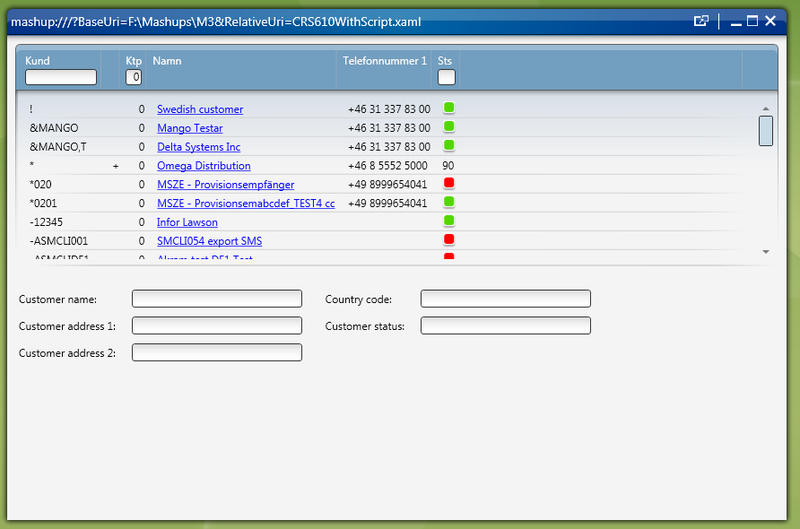 I’ll do an example with a mashup that loads CRS610 and reacts to CurrentItemChanged to load related data in a MIPanel. The events hooks everything together and I’ll have a Startup event and a CurrentItemChanged event. This is what the final result looks like. Ok, I have a few personalizations in my list so your mashup will not look exact the same. The real trick here is to dispatch the call that sets the selected index. This is a good trick to test when setting focus on controls as well becuase you might not be able to set focus but if you dispatch it to later on the UI thread it might work just fine. Also notice that I used a check to see if a JScript is running in a Mashup. Nice sample of Mashup + Script. It will be very useful! Accomplished an auto select on the first row of a startup list by adding a second event with SourceName=”CurrentList” , SourceEventName=”Running”, TargetEventName=”Apply”. Now looking for a way to auto select the first row on a list panel that has been triggered from a CurrentItemChanged event on a previous panel. With the many enhancements that have been made for mashups since this post, has an option been added that does not require a JSCRIPT? The logic used to auto select at startup does not seem to work. For start thanks for this post, i know it’s an old one. I duno if you will see this message, ans if you can answer to my question, but you said, you attach the script to CRS610MI. So my question is, How can i attach a script to an API. I find nothing on this subject. Thanks a lot if somebody see my bottle in the sea.